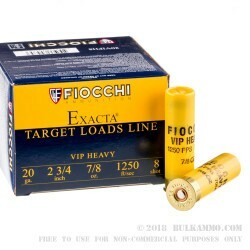 As one of Italy’s oldest and largest ammunition manufacturers, Fiocchi Munizioni has very rightly earned their reputation for making fine products. 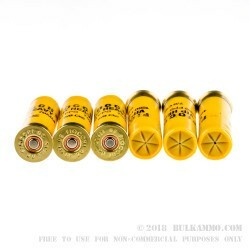 Their shells’ sturdy plastic casings, reliable primers, and clean burning powders (sourced exclusively from the United States) are relied on by shooters for a variety of purposes. 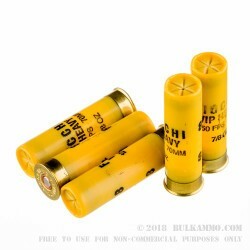 This 20 Gauge shell is loaded with ⅞ ounces of #8 lead shot -- approximately 359 of the .09” diameter pellets, to get into specifics. 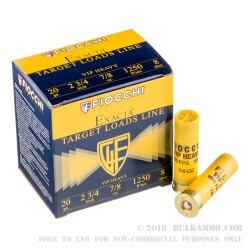 This shell really shines on the range, as its fast 1,250 fps muzzle velocity coupled with its shot’s good spread is perfect for busting clays at a distance of about 30 yards, even while they’re whizzing away at breakneck speeds. You may also use this shell for hunting, but stick to dove-sized birds if you do. You’d have to be very close to larger game for it to be effective, and their meat would be of little value if hit them anyway.